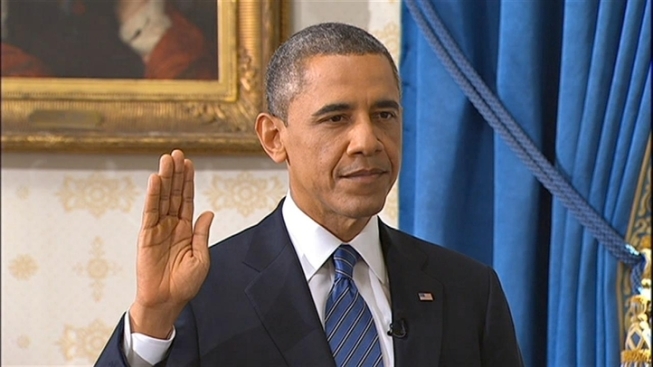 Stepping into his second term, President Barack Obama took the oath of office Sunday in an intimate swearing-in ceremony at the White House, the leader of a nation no longer in the throes of the recession he inherited four years ago, but still deeply divided. The president, surrounded by family in the ornate White House Blue Room, was administered the oath by Chief Justice John Roberts. With Obama's hand resting on a Bible used for years by Michelle Obama's family, the president vowed "to support and defend the Constitution of the United States," echoing the same words spoken by the 43 men who held the office before him. "I did it," Obama whispered to his youngest daughter, Sasha, as he wrapped her in a hug moments later. The president said the oath in just minutes before noon on Jan. 20, the time at which the Constitution says new presidential terms begin. There was little pomp and circumstance Sunday — Obama walked into the room flanked by his family and exited almost immediately after finishing the oath. He'll repeat the swearing-in ritual again Monday on the west front of the Capitol before a crowd of up to 800,000 people. Only about a dozen family members were on hand to witness Sunday's swearing in, including the first lady, daughters Malia and Sasha, the president's sister, Maya Soetoro-Ng, and her family. Mrs. Obama's mother, Marian Robinson, and the first lady's brother, Craig Robinson, and his family were also on hand, along with a few reporters and photographers. Yet the mood in the nation's capital was more subdued during this year's inaugural festivities than it was four years ago, when Obama swept into office on a wave of national optimism, becoming the first African-American to hold the nation's highest office. Since then, he has endured fiscal fights with Congress and a bruising re-election campaign — and has the gray hair and lower approval ratings to show for it. Ahead of his swearing-in Sunday, Obama, along with Vice President Joe Biden, solemnly honored the nation's fallen soldiers during a wreath-laying ceremony at Arlington National Cemetery. On a crisp, sun-splashed morning, Obama and Biden placed a large wreath adorned with red, white and blue ribbon, in front of Arlington's Tomb of the Unknowns. Holding their hands over their hearts, the two leaders stood motionless as a bugler played "Taps." From Arlington, Obama joined his family at a church service celebrating Martin Luther King Jr. 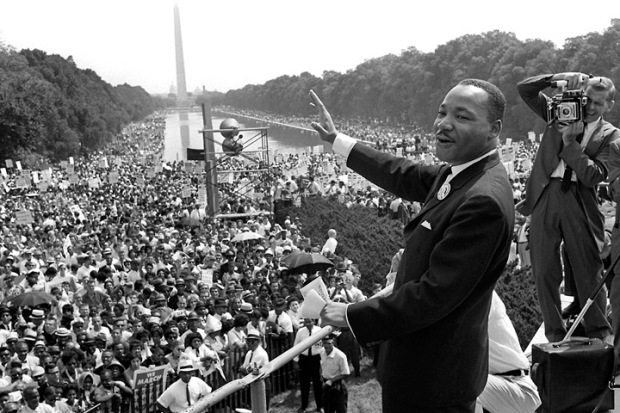 The president's public swearing-in on Monday coincides with the national holiday marking the fallen civil rights leader's birthday, and Obama has invoked King's memory throughout the lead-up to the inauguration. The Rev. Jonathan V. Newton, an assistant pastor at Metropolitan African Methodist Episcopal Church, prayed for God to prepare Obama for battle, "because sometimes enemies insist on doing it the hard way." Biden took the oath of office earlier in the morning, surrounded by family and friends for a brief ceremony at the Naval Observatory, his official residence in northwest Washington. Justice Sonia Sotomayor, appointed by Obama as the first Hispanic to serve on the Supreme Court, administered the oath of office to Biden, who placed his hand on a Bible his family has used since 1893. Among the 120 guests on hand to witness the vice president's second swearing-in were Attorney General Eric Holder, departing Interior Secretary Ken Salazar and several Democratic lawmakers. A crowd of up to 800,000 people is expected to gather on the National Mall to witness Obama's second swearing-in, which will take place on the Capitol's red, white and blue bunting-draped west front. Roberts, who famously flubbed the oath of office that Obama took in 2009, will administer the oath on Monday. Sunday's smaller ceremony was a function of the calendar and the Constitution, which says presidents automatically begin their new terms at noon on Jan. 20. Because that date fell this year on a Sunday — a day on which inaugural ceremonies historically are not held — organizers scheduled a second, public swearing-in for Monday. Once the celebrations are over, Obama will plunge into a second-term agenda still dominated by the economy, which slowly churned out of recession during his first four years in office. The president will also try to cement his legacy with sweeping domestic changes, pledging to achieve both an immigration overhaul and stricter gun laws despite opposition from a divided Congress. But for one weekend at least, Washington was putting politics aside. Obama called the nation's inaugural traditions "a symbol of how our democracy works and how we peacefully transfer power." "But it should also be an affirmation that we're all in this together," he said Saturday, as he opened a weekend of inaugural activities at a Washington elementary school. 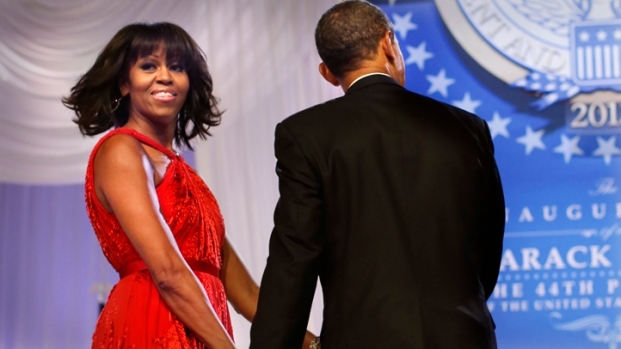 Obama and Biden were to address supporters Sunday evening at an inaugural reception. The president planned to save his most expansive remarks for Monday's inaugural address to the crowd gathered on the Mall and millions more watching across the country and the world. Obama started working on the speech in early December and was still tinkering with it into the weekend, aides said. Local officials were busy touching up Washington for all the hundreds of thousands of guests arriving for Monday's swearing-in. Work crews were trimming overgrown grass and trash from walkways along city underpasses, erecting first aid tents and setting up traffic detours. Swarms of tourists easily roamed city streets Sunday ahead of the pedestrian gridlock sure to come with Monday's full inaugural program. The president's address will set the stage for the policy objectives he seeks to achieve in his second term, including speeding up the economic recovery, passing comprehensive immigration and gun control measures and ending the war in Afghanistan. Aides said Obama would save the specifics of those agenda items for his Feb. 12 State of the Union address.